Kaoliang Liquor, the clear spirit that gets its name from the Mandarin word for sorghum is a favourite spirit among Taiwanese retirees. While it has fallen out of favour with the youth who have turned to the influence of Western palates, Kaoliang liquor remains to be a must try for any visitor to the Republic of China (Taiwan). Kaoliang Liqour is a strong distilled spirit made from fermented sorghum (which is called gāoliáng/kaoliang in Chinese). It is made and sold in both mainland China and Taiwan, and also popular in Korea, where it is called goryangju. 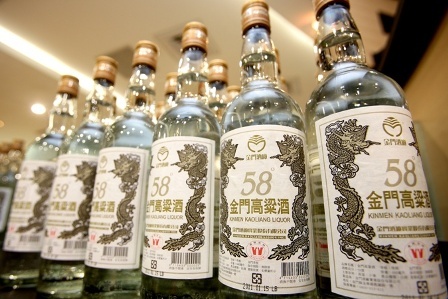 Kaoliang is an important product of the islands Kinmen and Matsu which are under the jurisdiction of Taiwan and the liquor packs a punch with alcohol ranging between 38 and 63 percent. Kaoliang Liquor was first manufactured in 1952 by the county government distillery, now Kinmen Kaoliang Liquor Inc, to provide liquor provisions to a military garrison. The commander of Kinmen’s defense base, came up with the idea of encouraging local farmers to grow sorghum and barter their harvest for an equal quantity of imported rice. Since then, the public-run corporation has played a fundamental part in the local economy as the major source of income and a provider of more than 1,000 jobs. Repeated fermentations and distillations produce a clean liquor. It is made in three major stages over more than two months. In the first phase wheat and water are used to produce yeast, the foundation of all alcoholic beverages. Cooked sorghum is mixed with the yeast in the second step to begin fermentation, followed by two hours of distillation. After that, the grain goes through another fermenting process before being redistilled one month later. Then liquids from the first and second distillations are blended to create a fine tasting kaoliang at an appropriate strength. The liquor has to pass quality testing by professional spirits experts before it can be bottled and sold. Its taste is sweet and round, and its touch is pleasing to the palate. It is also the perfect accompaniment to Asian cuisine such as stir-fried dishes and hot pots.